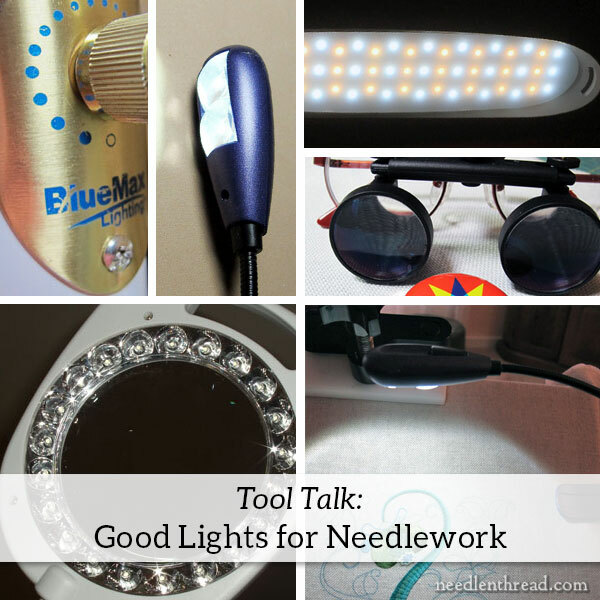 Good Lighting for Needlework – Your Eyes Deserve It! Lately, I’ve been working on some relative small embroidery. Not miniature embroidery, but rather little things that require fine threads in order to get a balanced look to the finished embroidery. And while I’m embroidering these little things, often with only one strand of floss, I’m constantly reminded of the necessity of good lighting for needlework. Couple this with the fact that I’ve had a lot of requests for recommendations for good lighting recently, and I figure it’s a topic that we should revisit, especially for those who are in the market for a good stitching light and for those who don’t realize just yet that their lighting might not be adequate. So, today, let’s have a little chat about lights! 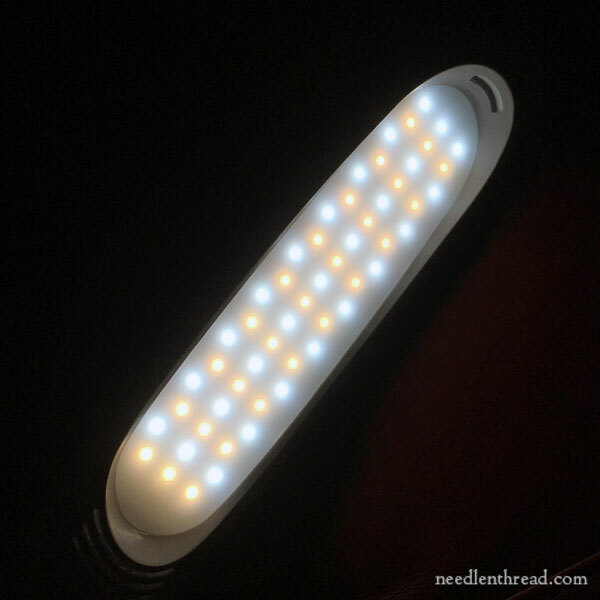 I’ll recap some lighting options that I’ve reviewed here on Needle ‘n Thread (and that still work great for me), and I really hope everyone else will chime in down in the comment section and let folks know what light you use and why you like it! Together, we can help fellow stitchers make informed decisions on lighting solutions for needlework. And…shhhhhhhh! Just between you and me and the lamp post, I’ve also include a good coupon code exclusive to Needle ‘n Thread readers for one of the lights. The code is from last year, but it still works! It’s true that a hundred and fifty years ago – and stretching back into centuries – embroiderers didn’t have great task lighting, and they still produced beautiful embroidery. Even so, this is not a good excuse to neglect good lighting today. We have a plethora of good lighting available on the market, for every budget. Your eyes deserve excellent light! You’ve only got two of them, and they can’t really be replaced. That said, a sunny window on a cloudless day can provide wonderful light, so even if you can’t afford or don’t want to make the investment in a task light right now, use free sunlight! While working in dim light – and reading in dim light – don’t necessarily make your vision worse (even though that’s what Mom or Dad always said when they caught you reading in a dim room! ), it can cause eye strain and tire out your eyes. And when it comes to embroidery or handwork, often we don’t realize what we’re not seeing, because we’re working in dim light. So if you’ve ever looked at your embroidery and thought “Why does it look so crooked?” or “Why is my spacing off?” or “Why is the fabric visible behind those stitches – I thought I covered that area completely!” … it could very well be your lighting! Another point, too: if you’re struggling to see details and you think you must need magnification or reading glasses or new specs all around, you might first consider how good your lighting is! Often, the problem is not a need for magnification, but rather a need for better lighting. 1. Will the light be in a permanent spot, or will I need to move it around? If the light will be in a permanent spot, it’s ok to have one with a heavy base. If it’s in your living room, do you need it to be decorative, or is it ok if it’s just functional? 2. Do I want a light I can travel with and use at home as a task light? If you want a task light you can move around and even take with you when you travel, you’ll need to consider the weight of the thing and its size and package-ability. Can you pack it up and move it easily? And will it still serve your purpose as a good task lamp at home? While it would be swell to have unlimited funds for our needlework or anything else we want, the reality is that most people don’t, so we have to consider price tags carefully! That said, I often find it’s a little more sensible to spend a little more for the better light (or whatever) that will last longer or fulfill all my needs (now and future needs), rather than spend less this month or this year, only to have to buy again next month or next year. 4. What configuration do I want? A floor lamp? A desk or table lamp? 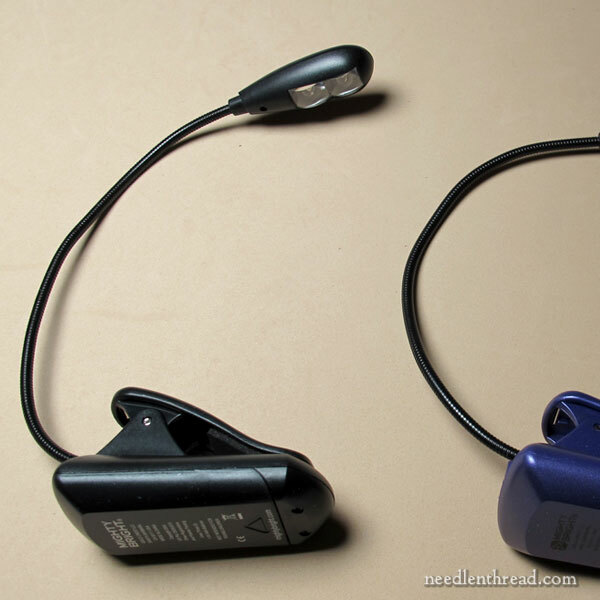 A clamp or clip-on light? Good task lighting comes in all kinds of configurations. There are floor lamps with heavy bases. There are floor lamps with lighter bases. There are table lamps with heavy bases and table lamps that are much lighter. There are large clamp-on lights that can be fixed to the edge of a table or to a needlework stand or what-have-you. There are clip-on lights – much smaller lights that can clip onto a frame or hoop and that are little and easy to travel with. There are lights that you can wear around your neck (I don’t have good luck with these) and lights you can wear on your head! 5. Do I really need magnification, and if so, do I want to include that in my lighting option, or keep it separate from my light? Magnification can come in magnifier / light combination units. And magnifiers can be bought separately. If you know you need magnification, then consider that when you’re looking for your light! So I’ve been doing this whole Stitching Thing for a little while, and I’ve tried a lot of lights. Below are the ones that work for me. In my workroom, my permanent lighting solution is in the form of two floor lamps that I shift around as I need them (though they are heavy). 1. I’ve not found brighter task lighting anywhere, that offers full spectrum light and can be dimmed. It’s like being out in full sunshine but without the harsh shadows, so it works well for stitching, but also for photography. 2. The lights don’t pulsate, which, again, makes them work well for photography. Often, your eye might not see that a light pulsates, but once you turn a camera on, you’ll see it and your photos will reflect the problem. These are my most often-used lights, because that’s where I do most of my work. Keep in mind that the BlueMax lights are not LED and they do give off heat. For traveling – when I’m going to be staying in a hotel or at someone else’s house where I’m not sure of the lighting – or for moving about the house with a task lamp, I use the Stella Two desk lamp, which I reviewed here. The Stella Two desk lamp is super light, it’s flexible, it fits in a great carry-box, and it offers a triple-range of LED lighting – warm, cool, and combination. The lighting is excellent, and I couldn’t be happier with the portability. If you attend workshops where you have to bring your own light, this is a great option. You can use it in the workshop and in your hotel room and have great lighting to work by. That said, I never use it for photography. Although there is no visible pulsation when you’re working under it, if you turn your camera on to snap a picture, you’ll get waves. Since it’s LED, it doesn’t put off any noticeable heat. Those who want to avoid a heat-producing light yet still have an excellent work light, this is one to look into. I’ve heard great things about their floor lamps, but I’ve not tried one. I just use the table lamp version. And I even have a coupon code exclusively for Needle ‘n Thread readers for Stella lights, which I think is mighty nice of the company. If you purchase a Stella through their website and enter mcbrite in the promotion or coupon code box at checkout, you’ll get 15% off your purchase, plus free shipping within the US. Not bad! My favorite lights to use for car traveling – and I would think airplane and train travel as well – are Mighty Bright clip on lights, which I reviewed here. They’re made for reading and such, primarily, but they work fine for needlework lighting that’s close and directed, when you’re in a small space. This Dublin Craft Magnifier is the one I’ve had for years, and I’ve not had any need to replace it yet. It still works great! I know there are other brands out there, and eventually, I know I’ll need to get a couple more floor magnifier / light combos (when I finally get my Dream Workroom and Classroom Space – some day! ), but for now, this one is still plugging away for me when I need a magnifier. CraftOptics are the Luxury Magnifying and Lighting Solution for folks who really need magnification, who wear glasses already, and who want excellent, focused magnification that will allow them to look at their needlework, and still be able to look up and see around them through their regular prescription. I’ve reviewed CraftOptics here, and I highly recommend them for people whose vision is holding them back from their needlework. The lights above are not the only lights or light / magnifiers I’ve tried. They’re the ones I’ve stuck with and been very happy with, after trying other lights. I know many folks use Ott lights, and they are a serviceable and affordable option for a first task light. I don’t use them anymore, but I would use them in a pinch on the principle that anything is better than nothing. They just aren’t an absolute favorite. I can see them pulsate, for one thing. They aren’t the highest on the full spectrum scale, for another. And they’re not quite bright enough for my every day task lighting. What lighting solution (or lighting and magnification solution) do you use, and why do you like it? Share your input below, and let’s help people who are looking for lighting find the perfect light that will work for them! I used the Dublin craft magnifier all the time because I have to have a magnifier and light and I find this is the best lighting for me. Although last year my Dublin craft magnifier snapped off in the middle and I had to buy a new one and I bought a Pure light magniifer and light which is excatly the same as the Dublin light for less money and I could buy it in the UK. Thanks for reviewing the options for good lighting with us, good lighting is essential for embroiders and thanks for the discount on the Stella light. On the subject of lighting I tried many different options. By accident I found a Table Light by TaoTronics that I am very pleased with. It does use a cord, but it is LED with 4 different task settings and 3-5 levels of brightness, it swivels and folds up (not completely, but enough to take traveling), it is lightweight enough to move from room to room if needed. I stitch next to a table so this is the type of light I prefer. Also, surprisingly inexpensive. Hope this helps. Call me a dinosaur but I still use a Dazor floor lamp/magnifier that I purchased at least thirty years ago. It has served me well. Its base has casters to roll around on. Downside…it’s big and rather awkward to move. I bought a replacement tube when I bought the lamp but the original tube is still working after thousands of hours of stitching. When I bought it, I think it was probably the only brand of lighting/magnification available. Hi, Rita! My mom had a Dazor as well. It lasted forever!! Can’t be a good thing, when it keeps on working!! I live in Devon, England in a cottage with little natural light. I purchased a standing lamp about 3 years ago called a Purelite Lamp which is manufactured in Aylesbury, Buckinghamshire, England. I purchased it from the manufacturers for £50 and it has changed my stitching life. It is a magnifying lamp with a ring of LED lamps all around the edge and gives a magnificent bright light that doesn’t hurt the eyes. I couldn’t do any embroidery without it. I take it with me to a craft morning I attend every week and to a monthly meeting of The Taw and Torridge embroidery group. It’s a wonderful piece of equipment. Light to carry anywhere, although it needs a power source. Based on your previous recommendation, I bought a Dublin Craft Magnifier and I absolutely love it. Anyone wanting to improve at satin stitching (or any other stitch requiring great precision) should try one of these. I also want to praise the flexible stem (or is it neck?) , because unlike other bendable lights I’ve tried, it has really kept its support structure along with its flexibility. I’ve been using an older Luxo magnifier light that a friend passed along to me. I don’t know how I lived without it. It is currently on a heavy base for use on a table, but I’ve been eyeing a floor stand for it as it would be much easier to move around. Thanks, Mary, for the discussion of lights and magnifiers. The thing that you did not really discuss was portable/rechargeable light/magnifier combinations. With EGAs new policy of no extension cords, I’ve been searching for a combo that can run on rechargeable battery for a full day of stitching in workshops and classes. Do you have some suggestions? The Dublin magnifier (and other similar magnifier light combos) often have a battery option. They aren’t rechargeable, but since they’re LED lights, the batteries last a pretty good length of time (longer than non-LED lights). Mighty Bright makes a clip on magnifier / light combo that’s battery charged, with (so they say) a 40 hr battery life. Most of the rechargeable task lights I’ve researched all have the same flaw – the lights begin to fade pretty quickly (within anywhere from 10-30 minutes, depending on the light). The charge usually lasts about 2-2.5 hours (despite claims of longer charges by the companies who make them – probably because they’re basing the charge time on the lowest light setting), but that 2-3 hour charge is rarely at full brightness, with the lights losing brightness as the minutes tick by. This could be rather problematic in a workshop scenario. I think your best bet, though it’s less eco-friendly and costs more, is a regular battery operated combo unit, like the Dublin or another that has good reviews. Even if you only get 30 hours out of a set of batteries, that would easily see you through a workshop, and you can always tote along backups. But if you rely on a rechargeable USB option and you can’t charge it during class time, you’d be stuck! I’m not sure if the Mighty Bright light / magnifier clip on combo would be the most comfortable option for a workshop. There’s not a lot of reach on those things – on small frames and projects, especially if you’re working in a small space (airplane, car), they’re fine. But if you’re working on a larger project and you’re not concentrating on one limited area but working around in different areas on the project (as is often the case in workshops), the reach of the light and magnifier on the Mighty Bright might be too limited. I have used the “Mighty Bright” lights for a long time and love them. You can get a plug in attachment so you don’t have to use batteries, you can plug it into a wall outlet. They are bright enough to read by with or without any other lighting. I have the4 hammer-head shark one. I love it! Hi, Christine – Aaaaahhhh – I wondered if anyone would mention this! I tried the Japanese lamp box, and my whole experience ended up more of a comic routine than anything else. I set it on the edge of my frame, with an extra slat for support, so that the light shone out onto where I was embroidering. It gave “ok” light, but directly from the side, which cast shadows I didn’t really like. And then, every time I moved or knocked the frame, the thing would scoot a little. And then of course, I knocked the frame from below, and that sent the light off the frame altogether. And then I thought maybe I was using it incorrectly. So I set the box on top of my ground fabric (stretched taut in the frame) and over the area I was stitching, thinking that maybe I was supposed to stick my hands into the box and work like that. But obviously that didn’t work!!!! I gave it an honest try, but without bending down, I couldn’t see into the box, and when I got myself into a position where I could see into the box, it didn’t matter anyway, because my hands were in the way! I realized that was rather a silly theory about how the thing was supposed to work. So I went back to the side lighting, but gave up on that pretty quickly. As far as lights go, given the technology we have, I found the whole lamp box approach rather inconvenient and limiting. So I passed it off to a friend who does lettering. She liked the uniqueness of it, but the shadows were problematic for her, too. The dimmer the room, the more pronounced the shadows. I use a pair of Stella floor lamps in my living room, one on each side of the couch. The biggest problem I have with them is seating the pole in the base, hence 2. I travel with the Stella 2 and love here. It’s only $10. Super bright. Lightweight and portable. Packs in my needlework bag to go to my Mom’s. LED, no heat. I’ve used it for the last 5 years and it’s still going strong. Yep, this is the one I’m talking about in my reply above! Ikea just brought back the Janso floor lamp. Husband bought a second one to use at his loom when weaving and swears by them. Of course one cannot take it easily with one, but if one is staying at home and working it is great. I love this one! I use the clip on version and have bought them in several colors since they are so cheap! I have an old ikea gooseneck floor lamp with a new higher wattage (I forget what but it is a 100 watt equivalent) daylight LED bulb in it. I like the fact that I can aim it exactly where I need it and it doesn’t overheat me. Obviously it is not very portable. So far I only need reading glasses so change to a stronger pair for very fine work. I also like Hazel Blomkamp s suggestion to wear readers over prescription lens. A friend tried it and likes it. IKEA also makes a little LED gooseneck lamp that’s similar to the floor one, only significantly smaller, for desktop use. It’s about $10 and super portable (well, it needs a place to plug it in). You can direct the light right on what you’re working on, and it’s a nice bright little light! The only problem I have with the gooseneck directional lights is the same problem I have with the Mighty Bright book lights – they illuminate only a very limited area. They illuminate it well enough to stitch by, but when I’m engulfed in a long stitching session, I like to have my whole work area lit up, including my tools and threads and such. Thanks for talking about lighting. It is so important. I’m now in Florida escaping the Canadian winter, and find rented accommodation isn’t the best for lighting. I use the Beam ‘Read light which hangs around my neck and focuses light right where I am working. It isn’t perfect, but it is darn good for my purposes. I think you wrote about it once upon a time. The Blue Max Lights are on sale at Full Spectrum for 50% off. I have two Dazor floor lamps as well as a Dazor desk lamp. All three have magnifiers on them. I’ve had one of the floor lamps since 1988, it still works like the day my Mom gave it to me. I replaced the bulbs about a year or so ago with daylight bulbs. The only issue I have with the lamps is that you cannot let sunlight come into contact with the magnifying lens during the day when not using the lamps. I made that mistake and the carpet in my craft room started burning, as well as a wooden end table. When not in use, I cover the magnifying lens with hand towels to prevent the sunlight from hitting the lens. While I have an Ott light floor stand model, which I have had for many years, more recently I find myself using my Blue Max table lamp (they didn’t have a floor model in stock locally) and have a floor lamp in which I have installed a 100 watt equivalent daylight LED bulb. As you say, lighting makes such a huge difference to whether or not you need magnification. When I first wanted a work light years ago Dazor lamps were about all that was available and they were fluorescent. That was the first indication that my eyes were sensitive to the 60 cycle hum they produce. The floor lamp is now gone. The table lamp is somewhere in storage and my husband has the one that can be screwed to desk or table on his workbench. I have tried the Ott light portable but there again it produces the 60 cycle hum. With the advent of the LED bulbs my problem has been solved. I have a Mighty Bright the you picture in the article which I love. Toe portability means I can move it to whatever project I’m working on. But best of all are my Foster Grant Readers. My children call them my head lights ;)). They not only provide focused light on what I’m working but also the magnification I need for 32-35 count linen. However nothing beats beautiful, clear sunlight for stitching of any kind. Mary you are so right. I took your advice and went out and got 2 lamps. I purchased the Daylight Naturalight LED Floor Lamp, 5-Inch. I got to try it at the SF School of Needlework and Design and it was a marvel! It has very low low heat. This is super important, upstairs in my croft loft it gets warm! So warm, that we take winter naps there. But in the summer with the iron going, it can get down right HOT! I went through 2 other OTT lights and was very unhappy with them. One broke at the telescoping pole in the first month. The other I had to write to get a new bulb after 3 months. Then I had to wait for it to come in the mail. What a nuisance. Since I was getting new lamps, I decided to go for magnification. No more wonky stitches on my embroidery! (Well, none that are from not being able to see). It has a very large 5-inch lens with 2.0X Magnification. No more red tired eyes for me. I read my dear spouse your article about eye strain, and he said, “Honey, buy two”. They are also great for removing slivers! Thank you Mary! I see the light! Just went to Full Spectrum Solution and they are having a 40% off sale! That seems like a lot…good as big box stores. Which wattage do you use/recommend? 40, 70, ? I use a flexible floor lamp, slim and unobtrusive that I bought at IKEA for $39. I actually bought 3 because you can’t replace the bulb…didn’t want to be stuck in the dark, so to speak. I’m now in need of lighting in my new home’s craft emporium. I use the 70 w dimmable. One thing I struggle with is lighting. I seem to be affected by the lightbulbs? Weird I know, except I am buzzing if I am close to an Ottlight, LED or a daylight light bulb. Due to this affliction, all my stitching and sewing/quilting is done with normal daylight. Any suggestions ? We are so lucky, our ancestors did all this by lamp or candlelight. hi. I still use my Ott light on my stationary table at home, mostly after dark. My lamps are incandescent and just do not have enough light for detail work. Although lately trying to find the natural light replacement bulb has become problematic. I love my take along light. It is from Beam and Read, and is worn around the neck. The settings can be for 3 or 6 LED lights and they come with 3 fresnel magnifiers, as well. I haven’t had to use those as yet. Lightweight, very portable and directly focuses on my work! Great for reading in bed or travelling. Thank you for the tips on lighting; they will definitely influence my request for my coming-up birthday! 1) I have an Ott desk lamp that I use next to my sewing machine. It’s fine for me and wonderfully adjustable, but my daughter, who has really good hearing, cannot stand the whine. I don’t hear that at all, but I’m 70 and she’s much younger so it could be an issue for other young folks with acute hearing. 2) If you have a magnifier on a stand, and the stand is on your table inside a window, and the sun shines in your window and through the lens, it will burn your table. I have burned streaks tracing the pattern of the sun; I’d rather not think what could have happened had there been thin paper or other more flammable materials there. When using a lens, use common sense and a some high school science! 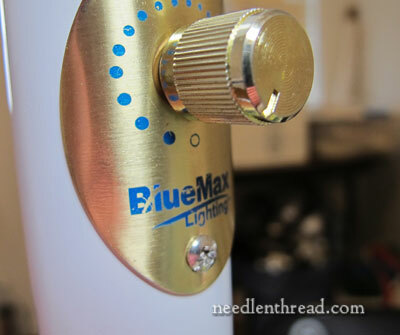 BlueMax has a sale going on now – the light Mary described is 50% off plus free shipping! I use the 3 in 1 purelight, it is light weight has a ring of lights and and an excellent manoeuvrable magnifier. I use it mainly as a floor lamp but it can be a table lamp and magniers or a clip on. What is more it is either mains or battery, so you can take it to workshops.best of all it costs under £50. I have tried ottlites and daylight lamps, but this 3 in 1 is much better and much cheaper. Thank you for revisiting lighting. I am thinking about getting a new clip on to a table light for my sewing machine. I have an Ott light by one machine. I like Ott lights, but the Blue Max light really spoils me. I have a Blue Max at my stitching area, after you reviewed them previously. I love the Blue Max and as you said, often find I don’t need magnification when using the Blue Max. It was nice to see it is still your recommendation. It was expensive, but well worth every penny. Also, if you have the SAD condition where you need to get plenty of sun, this light is used for the sun therapy needed. I don’t have that, but if someone does, that is a plus. Your reviews on so many stitching necessities has been most helpful. I love my Ott light floor lamp with a decorative shade. My only disappointment is that after many years of use (10+), the height adjustment no longer works. So I have it hard-fixed in one position. It was a long and tedious search. First I was excited by the Purelite 3 in 1, not least because it was the only affordable one with a gooseneck. But as I delved into the technical details I found out that a lumen of 165 is equal to less than 30 Watt – dimmer still than my normal floorlamp (that was way to dim)! By the way, Mary, according to the Bates method, working in dim light does impair the vision in the end – for the very reason of the eyestrain it causes, because nearly all vision problems are said to have their roots in tensed up and shortened ocular muscles (worsened still by wearing glasses all day round). I don’t know the truth about it, but I use this method (featuring daily exercises, cold water treatment, sunbathing etc.) for several months now, and I’m already able to read several pages without glasses, in other words, it works fine! But for stitching I prefer my magnifier lamp still 😉 – with frequent short breaks for the eyes, of course. My aging eyes and I thank you so much for this, Mary! Do you or any readers have a recommendation for a light that works with the NS4 system? I have the Chart holder/light/mag holder and would love to find a light that works in this opening! After your review of the Stella Two desk light and discount coupon, I decided to buy one for my home desk and loved it. Even sat there and did needlework to see how it worked and I LOVE it. The next time they went on sale I convinced my son and husband to buy as well. My son bought a desk version and my husband bought a floor version for his den. I bought another floor version for the living room so I can stitch on my comfy couch. I’m glad to hear your thoughts on the OTTlites, Mary, because I had been thinking about getting one. Now I’ll save up for something a bit better. After reading your article on the MightyBright clip on, I managed to find one here in NZ from a Music shop – best light, so easy to clip onto a range of hoops and frames, bendable and light weight. I also picked up a pair of magnifiers which have a range of lens’ which clip in and out, and it has a light as well. I will admit these have been used more often for removing splinters, but they are family favourites and I got them super cheap from wish.com. When we renovated our lounge, stitching was kept in mind & our lights are all LED cool light bulbs. I have a circular magnifying lamp. Without it I might as well give up embroidery altogether. I do needle painting and use mainly one strand of stranded cotton as well as no 40 sewing machine embroidery thread. The latter is thinner as the stranded cotton and I use it for extra fine work, like eyes. The beauty of the circular magnifying lamp is, it does not cast any shadows on your work and that is a big plus. I’ve had my Mighty Brite magnifying light for awhile now and it seems more dim. Because of this I’m looking at replacing it. So far, I’ve not found a supplier who sells the Dublin Craftlite. It looks like the company stopped responding to retailers late last year. I like the Mighty Brite as it doesn’t get hot, but this will be the third time I’ve replaced it in about 12 years. It seems to me that the maximum brightness lasts about 5-6 years. I guess for a light that averages about $100 that’s a fairly decent lifespan. I also have two Ottlites that I picked up on sale at Joann’s. They are both floor lamps. One does not dim. The other will dim but the reason I bought it is because it has a holder that swings out a bit where you can put a tablet. It also has a plug on the pole of the lamp for charging. I love that I can have a PDF pattern on my tablet at eye view. I love my Stella light 2. Originally I bought the floor model but where I sit it is too far from my work surface. Now my husband uses it for reading. I love the desk model so much I just bought one last week for my sister! I should have waited!!! Thanks for another great post. I also use a booklight, although I am not sure of which, when traveling. I started using it back when we stayed in hotels – we used to bring light bulbs, but never wanted to risk a fire by replacing the hotel’s 40 watt with anything more than 60 watt. Now we travel in a really tiny RV (think Chevy Van conversion). At night the car seats turn around and I have spotlight over my seat, but it is not always enough or the right angle for what I am doing and I continue to clip the book light onto my hoop. As an 1770s reenactor in her 60s my alter ego, Anne, will mention the problem with dim lighting to stitch by when talking with people while she is doing embroidery outside. (“So nice to be able to sit outside and I can see to stitch again as I cannot see to do so inside, even next to a window.” ) I had started adding this as part of her talking with the public when I read that generally ladies had to stop doing embroidery by 40 due to the lack of sufficient light for them to see. I use a 30w full spectrum floor lamp that has a magnifying lens, and a pattern clamp on repositionable goosenecks, and a small tray. It is made by Daylight, and I am happy with it. I also have the mighty bright for travel! Thank you for your recommendations! When I logged onto Blue Max for the floor lamp they were in the midst of 50% off sale , so I purchased both their floor lamp and the desk lamp. I did check out the Stella 2 but couldn’t walk away from the huge discount of the Blue Max! I just ordered the BlueMax desk lamp — it’s currently on sale ($100.00 off) and shipping is free. Right now, I have an Ott light (that isn’t working very well) and two cheap task lights that are pretty pathetic; so, I am really looking forward to the BlueMax! Thanks so much for your recommendations and explanations. I just use a nice but inexpensive LED desk lamp I got at Target. It’s a little warm toned for my taste, but I had to have -something- and the slim style of it would fit well in the space I had available. It’s got a 12″ bar of light that can be raised/lowered and rotated, plus a nice weighted base. I really like that it doesn’t put out heat too. If I need to take photos, I pull out my phone camera and one of those cheap clip-on selfie ring lights. Works great, puts out a lot of light, easy, cheap, portable, and is a more neutral tone so colors come out natural. It’s easy to wave around to get just the right lighting. Thanks for revisiting this important aspect of needlework. I had an Ott floor lamp, but it was a poorly made piece of junk. The adjustable arm kept wandering and then the ballast kept burning out, which always took the light bulb with it. I then got a Verilux floor lamp with a detachable magnifier, and I LOVE it! It is high quality, provides good light, and doesn’t appear to pulsate like the Ott did. The floor one isn’t LED, so it does get warm if you’re directly under it. I later got their desk version, which is LED, and it is also wonderful. I also got a travel light (2, actually, on a 2-fer sale) and they are also very nice. These are battery-powered, with a USB charging option. I found them to be reasonably priced and very functional. 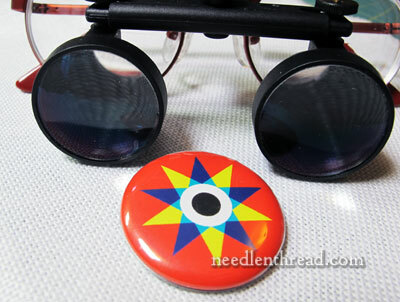 I first heard about these on another needlework site and ended up purchasing directly from Verilux online. I’ve never seen them in any retail stores, and I can’t say anything about non-US availability. I switched to BlueMax last year. Absolutely love the lighting it provides. After trying many brands, hands down it is perfect lighting for my less than perfect vision. What sold me on it was your clear photos, showing it truly wasn’t flickering or causing shadow lines, like Ottlight and a few others do. I don’t even want to pick up the needle without it on, I just love it. They have an excellent warranty another thing I considered when before purchasing. Downside? I have had to use that warranty over and over in just over a year. In the first year, 3 light bulbs went out, yet were only used 4-6 hours a day. A single bulb should last for years at my rate of use. Then the ballast died. Those were all replaced for free. A few weeks ago the switch died. I had to pay a silly high shipping rate to get it replaced though they did replace the actual switch for free. So I am not sure the lamp is sustainable considering how often something goes wrong with it. I have a Mighty Bright, I can’t use it for stitching, except in a pinch. Light is too harsh for my comfort. Sure is a handy little light though. They get used frequently for other things. So popular around this home, mine regularly gets stolen. Hi, Sara – that’s too bad about the problems with the light. I had a switch problem with one of mine, but that’s the only problem I’ve run into, and I was able to have it fixed. You’re right about the light – once you work under them, with the brightness and clarity they provide, it’s more difficult to get used to another light! Still, I use different ones when I travel or need to stitch in a tight space, since the BlueMax are anything but portable! I love everything about the Dublin light. The gooseneck is completely flexible, unlike many other apparently similar lights, and the table clamp and battery pack make it useful for classes. It gives plenty of light and with the magnifier I am able to stitch on 36-count navy blue linen. It was hard to come by some years ago when I bought it and apparently that’s true again. I tried a Stella floor lamp, but it is too tall to use in a low chair. If I tilted it so that it didn’t shine in my eyes, it shone in my husband’s eyes across the room. OK in the right situation, maybe, but it was disappointing after all the rave reviews. Keepsake Quilting has the Dublin Craft light. I have had one for several years and love it. The cost has increased since I got mine and Keepsake charges an extra $5 shipping, but for me, it was worth it. I usually just use it as a floor lamp, but it is nice knowing I have other options available when using it. I use ott lights when going to retreats or classes. They work pretty good in those situations. At home I am looking for something portable and easy to move. I will check out the ones you have suggested. What can I say, my sight is not good, so a good lamp is essential for me. On your recommendation in a previous article I bought the Stella Desk Lamp. Is it possible to be in love with a lamp? I truly feel blessed that the Stella came into my life. So much so that before the year was out I had saved up enough in my needlework budget to buy the floor lamp. These two Stella Lamps have made a tremendous difference in my life. For train travel I have a Mighty Bright that does just fine, considering. Thanks for your most helpful reviews, both now and earlier. I purchased a Stella floor lamp last year when Stella offered their promotion. I love my light! Besides having warm light, cool light, & a mixture of the two, there are four intensities of light. The floor stand adjusts in height & the arm of the light is flexible as well. The light is a clean design, takes up minimal space, and can be moved easily because it is not too heavy. Very functional & flexible! I am also enjoying it for reading. I use a dazor light that has a magnifier on it. I have had it a long time and I love it. it is old, heavy and well used. I would not give it up for anything. The blue max is on a very big sale. I ordered one. Hi, Barbara – the code mcbrite should work through 2018, and it includes free shipping and the discount, so it’s a better deal! It seems to be working from this end. Make sure you’re using mCbrite (no caps) – yours above says mEbrite. Ohboy. Maybe new glasses will help too . Thanks Mary! I’ll see if they’ll honor it post-order. Thanks for this great info! I’m glad you bring back important topics from time to time. Sometimes I’m ready to act the second or third time around. I think I’m ready to spring for a Stella light. Do you know how long the code is good for? I won’t be able to buy it fo a month or so. Many thanks for this site and all of the amazing guidance! I just saw the answer to my question in these comments, so oops! Sorry about that. Love the clip on book light! I clip it on my hoop when needed and works great! Mary, on your glowing review, I ordered 2 of the Blue Max 70W dimmable lights – a table model and a floor model,thru your link. They were 1/2 price and free shipping. I need good lighting in my workroom. They are supposed to arrive next week. I’m away till the end of March but will let you know how I like them. “Glowing” review! 🙂 I hope you like them as much as I do! I have been thrilled with my Stella table lamp. My husband was impressed and bought the floor lamp for himself. However, after a month or two, it needed to be sent back to Stella for a burned-out bulb, which was covered under warranty, including shipping. That part was good. A word of warning should you ever need to return a lamp to Stella: tape your name to the lamp. The one that was returned to us was not the one in perfect condition we sent back but one with 5 scratches, one very deep. They insisted it was our lamp and did not replace it. I just checked the website where your BlueMax 70 w dimmable floor lamps are and they are 50% off $139. I have found with lighting that most people use it incorrectly. If you are right handed you need the light coming from the left, and if left handed you need the light coming from the right. This way your working hand doesn’t create a shadow across your work. Hi – question for the stitchers in the UK. I am looking for a versatile table or clamp light with a magnifier. I see that a couple of people have recommended Purelite – any particular model? I have been looking at the Purelit 3-in-1 magnifying lamp on amazon.co.uk, but not sure. Any recommends / suggestions very greatly appreciated! Next Next post: Silk Roses & Goldwork…and Something Else?